CURRENT SHUTDOWN JOBS – Free recruitment Shutdown jobs A leading Oil & Gas Construction Company Urgently requires. Client Interview this month. Candidates who are Seeking for Current Shutdown Jobs can check the details of Latest shutdown jobs in the gulf for freshers that have been recently Posted on this Site. Here we are Updating all the details about the Shutdown Jobs like Job Description, Job Position, Salary Details, Educational Criteria etc.., Interested and Eligible candidates can Apply for the Job Interview. NEW OIL AND OIL SHUTDOWN JOBS – ENGINEERS (Mechanical, Piping, HSE, Project, Construction, Contracts, Planning, E&I) Apply to the Job recruitment to the Email Id: [email protected] E & I (Electricians, Instrument Technicians / Fitters, E & I Technicians / Fitters, cable Tray Fitters, cable Jointers). Apply to the Email ID: [email protected] MECHANICAL (Pipe Fitters / fabricators, Mechanical Fitters, Millwright fitters, Welders, General Fitters, Bench Fitters, tank Fitters / Fabricators, Riggers, Hydrojetters). Apply your CV To the mail ID [email protected] For more NEW SHUTDOWN JOBS Details check the latest Job Updates that have been posted on this Site. SAFTEY (Holewatchers, Firewaters, Saftey Watchers, Saftey/HSE officers). Send your resume to the Email Id [email protected] INSULATION (Sheet Metal Fitters / Fabricators, Painters) Send your resume to the Email Id: [email protected] GENERAL (Planners, Document Controllers, Time Keepers, Accountants etc), Apply your resume to the Email Id [email protected] Rush your CV, Passport, Photographs and all certificates to respective Email Ids given above or apply in person by courier / Speed post to Ambe International 507 Shah & Nahar Industrial Estate, Dr.E.Moses Road, Worli Naka, Mumbai- 4000018. call : (022) 61431234 / 1262 / 1275. Hydro Jetters, Manhole Watcher, Fire watchers, Torquing Technician, Saftey Officer. Gulf EXp is the must. Candidates who are Selected in the Interview will get Free Food and Accommodation Provided by the Company. TTC Industrial Area, MIDC, Rabale, Navi Mumbai. One of our valuable Client requires immediately for Construction Projects having experience in Oil & Gas,Refinery, Petrochemical Industries for long term. The candidates should possess 7-8 years of experience in their relevant fields. The candidates with Gulf Experience are preferred. The candidate should possess good fluency in English Language. The interested candidates can walk-in with experience certificates and original passport. 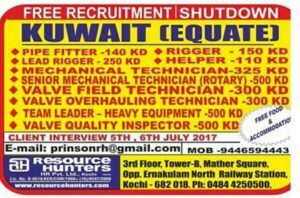 SHUTDOWN JOBS: UAE QATAR OIL & GAS SHUTDOWN, IMMEDIATE DEPARTURE MECHANICAL QC INSPECTORS EQUIPMENT/PIPING: Min. 5 yrs. exp. 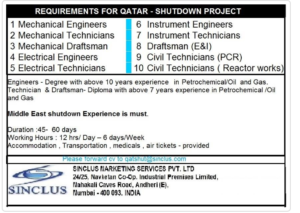 At least 2 shutdowns in Gulf COATING INSPECTORS NACE 2/ BGAS 2, Gulf exp is Must, Ex Cape preferred PAINTING SUPERVISORS NACE 1/BGAS 3, Gulf exp is Must, Ex Cape preferred PTW CLERK (30 NOS. With Good communication in English, 1-2 years experience as PTW Clerk, CVs required with Skype Id. SR. MECHANICAL TECHNICIANS (20 NOS) 10 to 12 years experience in Static equipment maintenance PICWS 10 NOS. ELECTRICIANS 05 NOS. PERMIT HOLDERS 20 NOS. FIRE WATCHERS 20 NOS. Candidates MUST have participated in min two Shutdown in Gulf, Candidates should be ready to travel in 7 days. WALK IN INTERVIEW ON 6″ FEB 2017 10 AM TO 4 PM or send CVs to [email protected] Bright International 31 Diamond Mansion, 36668 Kalbadevi Road, Mumbai 400002. I am looking For field/well head operator post.i have 10years experience in oil and gas field. I need Tower Crane Technician(Electrical & Mechanical) job . I am a Mechanical technician..I have a 14 years experience with iti+apprentice tranning..I am a offshore return in Qatar Rasgas company..
i am safety Engineer in tata steel jamshedpur in 6 rs exp. I m safety inspector for exp 4yr gulf.plzzz reply msg sir. I am interested pipe fABRICATORS jobs for shutdown. Now I’m searching for job opportunities in abroad.please let me know if you have any vacancies. I have completed MCA . I have 1 year working experience . I have good typing speed.I am interested to do job perfectly.I ready to join immediately. i am dioloma electrical engg. and i have four years gulf exp. as electrical maintenance tech. please update me for new jobs with high grade. dear sir im mohd manuar khan from gaya bihar india .i want to job as a plumber .i hv gulf experiance 3 years from saudi arab . so i want a job in shut down so plz inform me. I have completed BE Chemical. I have 5 year experience. I am interested to do job perfectly. I am ready to join immediately. 1&Half years… Now i have no job. Can u help me for getting a Good Job sir. sir i am looking structure engineer job,and i have a 1 year experience in this field. sir, i am looking a jobs for draftsman 2d & 3d design. i have gulf exprience 3 years in kingdom of bahrain. and 2 years in india in pune maharastra. sir i am looking qa qc piping inspector job,and i have a 7 year experience in this field. I am interested for studown jobs .supervisor or senior mechanical Technician . ( Rotating or static).maintenance jobs for pump, compressor, turbine all types .